Last March, when 400 economic developers and site selection consultants visited Cincinnati for the 2018 Site Selectors Guild Conference, about 50 experts attended a March Madness welcome reception at a revitalized downtown landmark where they enjoyed basketball, Irish dancing and were introduced to the region’s Foreign Trade Zone (FTZ) program. By sponsoring events like the Site Selectors Guild Conference, the Greater Cincinnati Foreign Trade Zone, Inc., representing FTZs No. 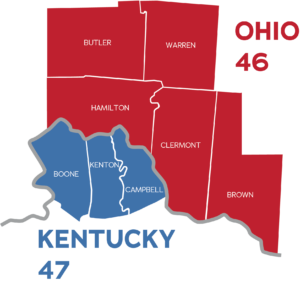 46 Greater Cincinnati and No. 47 Northern Kentucky, shared its message with a broad audience of national influencers responsible for key business expansion and retention efforts. Since 2014, the Greater Cincinnati Foreign Trade Zone, Inc. has significantly expanded its marketing program to raise awareness of the program’s benefits by adding investment partnerships, embracing digital marketing and social networking strategies, debuting a video and creating infographics that illustrate program benefits and the application process. Marketing the FTZ program is important because of the economic benefit it provides throughout the entire Greater Cincinnati and Northern Kentucky region beyond the value realized by qualifying companies using the FTZ program. The purpose of marketing the program is to reach prospective FTZ users and also to educate local economic development professionals and partners, such as developers and real estate professionals, and invite them to learn more about the benefits of FTZs. Located in eight counties in SW Ohio and Northern Kentucky, Foreign Trade Zones (FTZ) No. 46 and No. 47 are celebrating their 40th anniversary in 2019. As the program manager, The Port is using this anniversary milestone as an engagement opportunity to talk about the program and show off the newly finished video. We are also getting ready to launch a communication toolkit for economic development professionals and municipal partners located within our FTZ region. The toolkit is a ready-made marketing program, complete with case studies, slide-shares, information one-sheets, infographics and a list of regional resources with specific subject matter expertise. We will reach out to about 300 economic development and municipal partners with a link to this digital toolkit inviting them to share the benefits of the FTZ program with their prospects and key business partners. Assisting us with the deployment of the toolkit is REDI Cincinnati, the regional economic development organization covering a 15-county area. A valuable partner since 2016, REDI has co-promoted the FTZ program by including FTZ-focused questions on its business retention questionnaire in visits with more than 200 companies annually; highlighting the FTZ in its blog posts and inviting the FTZ to join site selection market day trips to promote zone benefits. Our strategy of deep regional relationships ensures that we have a wide range of businesses using FTZs and the FTZ program continues to serve Greater Cincinnati well. Helping people understand the program, especially within the framework of American trade policy, is important work. Melissa Johnson is Vice President of Industrial Development for The Port – Cincinnati; and director of Greater Cincinnati Foreign Trade Zone, Inc., which is managed by The Port. Contact her at mjohnson@cincinnatiport.org.